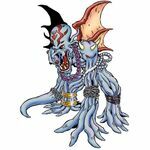 Throughout the Digimon franchise there are various references to the works of H. P. Lovecraft, in particular the Cthulhu Mythos. A significant number of these references are due to the influence of Chiaki J. Konaka, who is also an acknowledged Lovecraft writer and is known for occasionally adding Lovecraftian elements to his works. Dagomon is named after Father Dagon, a minor Great Old One named for the Semitic god Dagon, though its appearance is based on that of Cthulhu. The name of one of Ancient Wisemon's Special Moves where it summons the ultimate evil god from another dimension (Elder Sign) is a reference to the "Elder Sign", a magical symbol created by the Elder Gods as a form of protection against the Great Old Ones. Also, the description of the technique itself is a reference to the Elder Sign being a key "whereby the powers of the Elder Gods may be summoned when used with the proper words and shapes", mentioned in the Simon Necronomicon - The Testimony of the Mad Arab, which has strong associations with the Cthulhu Mythos, under the name "Agga". 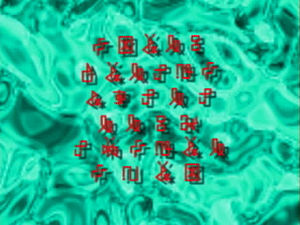 In episode 13, the original title itself is a pun on the alternative translation of Lovecraft's The Call of Cthulhu (クトゥルフの呼び声 Kuturufu no Yobigoe). This translates to "Ph'nglui mglw'nafh Cthulhu R'lyeh wgah'nagl fhtagn" (フングルイ ムグルウナフ クトゥルウ ルルイエ ウガフナグル フタグン), an occult phrase originating from The Call of Cthulhu which means "In his house at R'lyeh, dead Cthulhu waits dreaming". 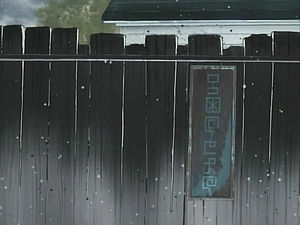 Later, when Hikari is alone, she walks past a sign on a fence that reads " " which translates to "Innsmouth" (インスマウス), a fictional town in Cthulhu Mythos. The mysterious entities that inhabit the World of Darkness asssuming the form of Hangyomon are a reference to the Deep Ones. In relation to their affinity for human interbreeding, they attempt to capture Hikari in order for her to mate with them. In episode 45, as Demon was being banished to the World of Darkness, he mentions "Dagomon's Ocean". It is unknown whether this link was an intentional one, though one may gather from this connection that this means Dagomon cannot hurt Demon. The two programs Hypnos uses, Yuggoth and Shaggai, are named after the fictional planets Yuggoth and Shaggai. Hypnos itself may be a reference to the short story Hypnos written by Lovecraft, albeit not connected to the Cthulhu Mythos, or the Elder God Hypnos. In episode 44, Uchiharato Tetsuo (内原戸 哲夫), seen being interviewed on the news during the D-Reaper crisis in West Shinjuku, is a professor from "Miskatonic University"[N 1], a reference to Miskatonic University, a fictional university in the works of Lovecraft that makes several appearances in the Cthulhu Mythos. ↑ In the North America dub of Digimon Tamers, Miskatonic is misspelled as "Miscatonic". This page was last modified on 8 April 2019, at 03:01.